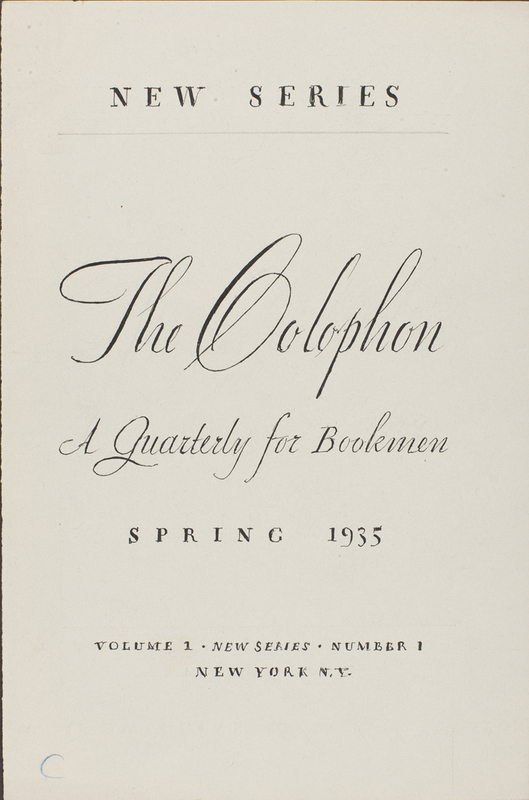 The Colophon: A Book Collectors’ Quarterly New Series, Vol. I, No. 1 (Summer 1935). Cover design by T.M. Cleland. Leaf ornaments by W.A. Dwiggins. What the revised version of The Colophon offered Dwiggins, besides financial remuneration and an opportunity to show off his design chops for a periodical, was a chance to test out Electra, his new typeface. The year before, when the typeface was still in progress under the name Experimental No. 55, Dwiggins had told Macy that he wanted to introduce it in the edition of Gargantua and Pantagruel he was designing for The Limited Editions Club rather than use it for The Dolphin. Dwiggins’ intent was to showcase the typeface where he felt it would make the biggest splash. It is unclear why he thought that it would be better to debut Electra in a limited edition novel rather than a periodical devoted to bookmaking. His subsequent decision to use it in The Colophon New Series is explainable even though it may seem, at first glance, like a contradiction. Comp for cover of The Colophon New Series by W.A. Dwiggins (1935). Illustration by T.M. Cleland. The frame below it was rejected. For the final frame design see the cover design at the top of this post. Image courtesy of Rare Books and Special Collections, Princeton University Library. 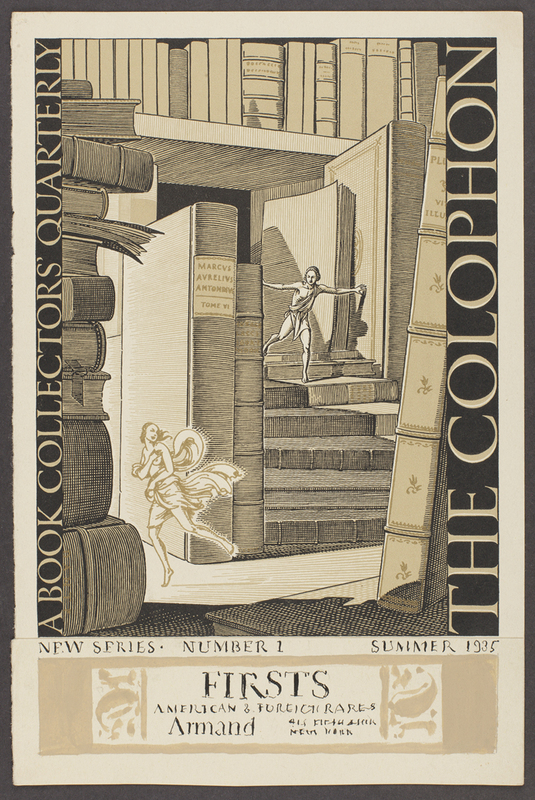 The amusing illustration on the cover of The Colophon New Series vol. 1, no. 1 (Summer 1935) was by T.M. Cleland. It was reused, with a change of color, for the other three issues in the journal’s first year. Dwiggins designed the spine and a frame for the volume information, though he was not responsible for the clumsy use of Goudy Oldstyle. Title page for The Colophon, Part V (March 1931). 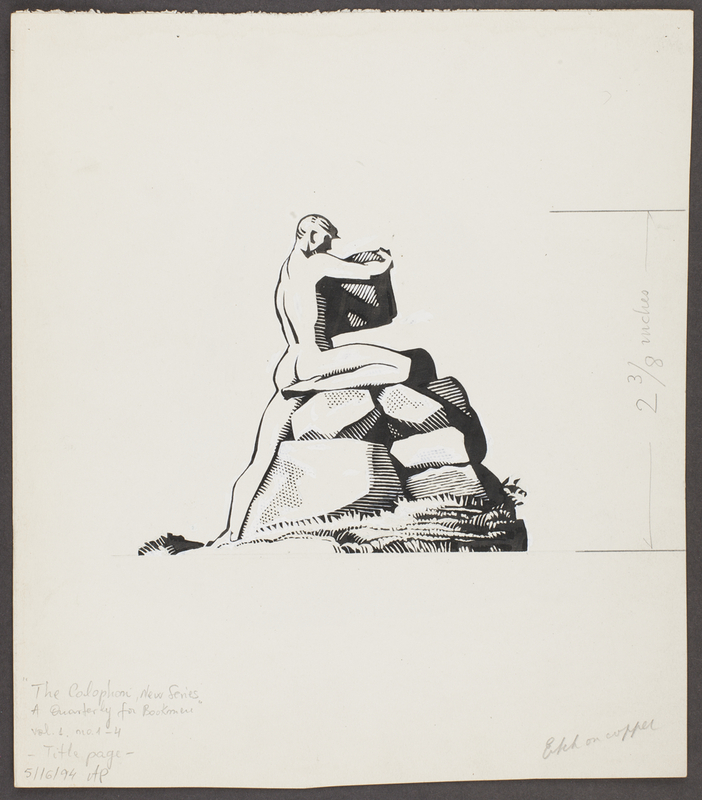 Illustration by Rockwell Kent. Title page for The Colophon New Series vol. 1, no. 2 (Summer 1935). Design, lettering and illustration by W.A. Dwiggins. Original artwork by W.A. Dwiggins for alternate version of illustration for title page of The Colophon New Series. Image courtesy of Rare Book and Special Collections, Princeton University Library. For the colophon of The Colophon New Series vol. 1, no. 1 (Summer 1935) Dwiggins created a parody of the title page illustration: a man resting against a pile of stones, mopping his brow, with the caption, “AND THAT’S THAT.” It was not used in subsequent issues. Colophon page of The Colophon New Series vol. 1, no. 2 (Summer 1935). Illustration by W.A. Dwiggins. Comp C by W.A. Dwiggins for the title page of The Colophon New Series. Image courtesy of Rare Books and Special Collections, Princeton University Library. Comp D by W.A. Dwiggins for title page of The Colophon New Series. Image courtesy of Rare Books and Special Collections, Princeton University Library. Dwiggins tested out other variations of the lettering for the title page, emphasizing “New Series” in one version. 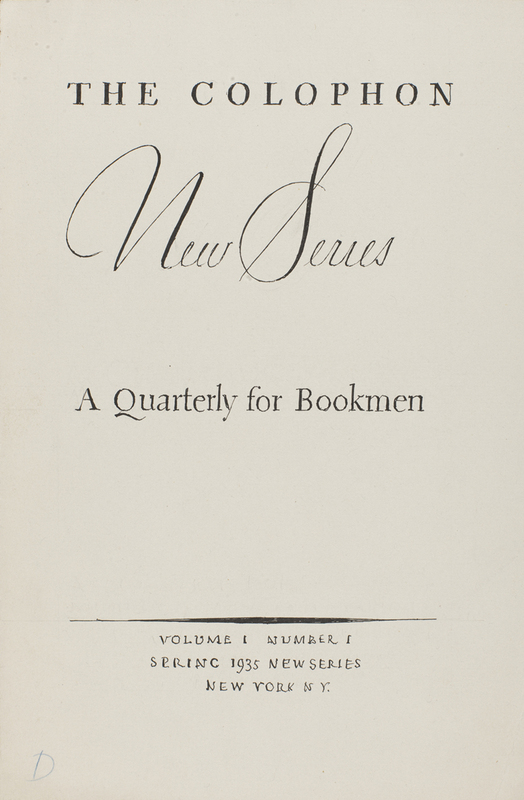 (Note the change in the journal’s subtitle from “A Book Collectors’ Quarterly” to “A Quarterly for Bookmen.”) He used the same personal pointed-pen script for the title of the limited edition version of One More Spring by Robert Nathan (Stamford, Connecticut: The Overbrook Press, 1935) that he was working on at the same time he was designing The Colophon New Series. 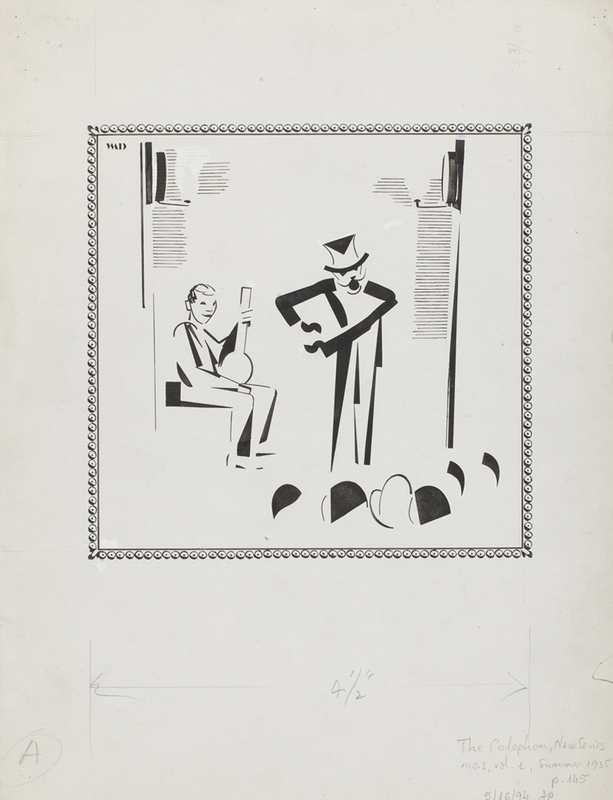 Both projects also shared Dwiggins’ interest in “abstract” illustrations. For the “Advertising Announcements” page he designed a stage scene with a master of ceremonies and a seated banjoist made from simplified stencil elements. For the final design, he dropped the pearl ornament border. 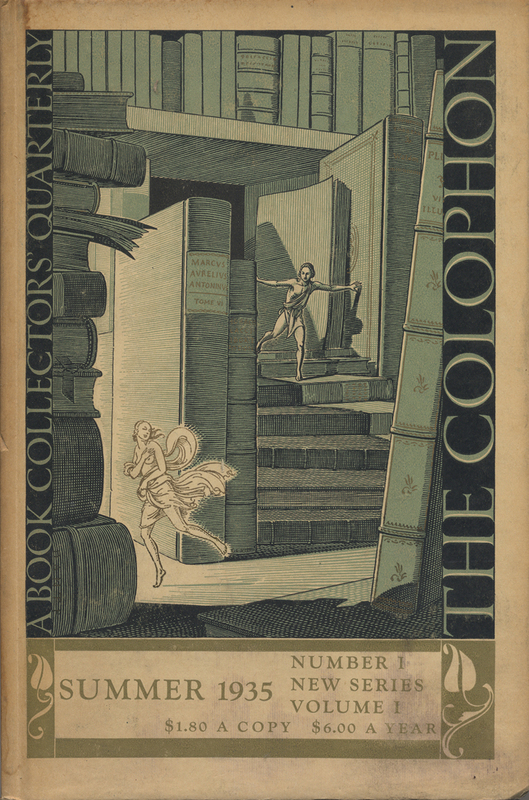 The illustration only appeared in the first two issues of The Colophon New Series. It may have been dropped because it was too “avant-garde” for the journal’s readers. 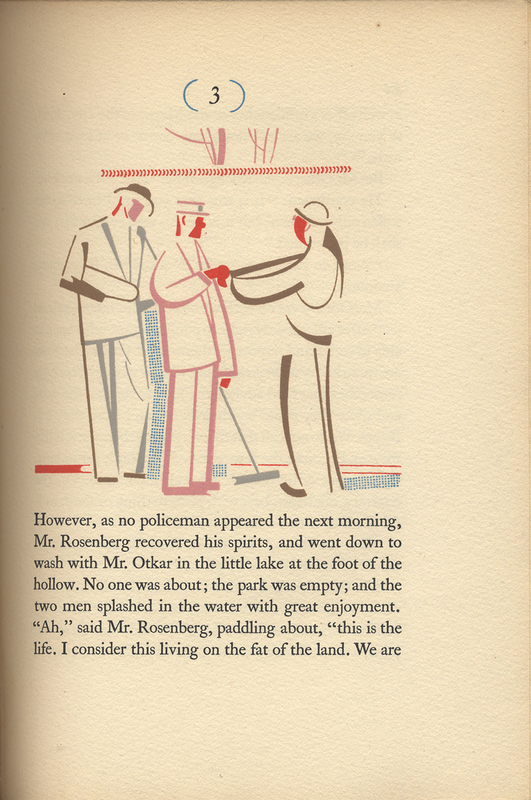 Certainly, it did not match the style of Dwiggins’ other illustrations for it. Original artwork by W.A. Dwiggins for “Advertising Announcements of Great Interest to Bookmen” in The Colophon New Series vol. 1, no. 1 (Summer 1935). Image courtesy of Rare Books and Special Collections, Princeton University Library. 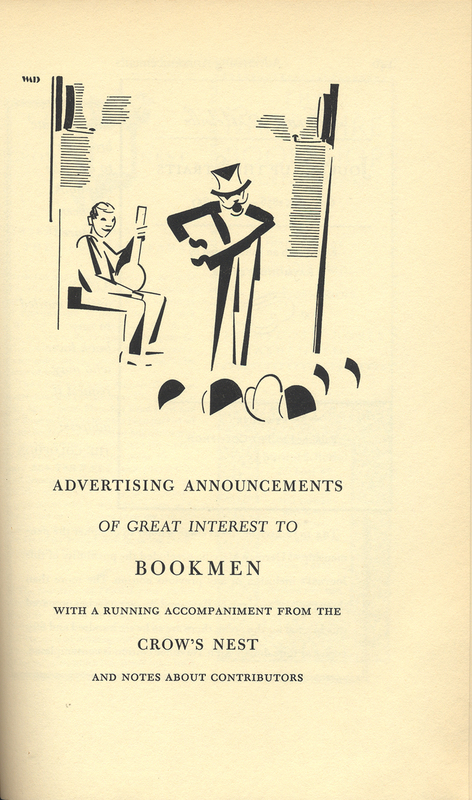 “Advertising Announcements of Great Interest to Bookmen” page from The Colophon New Series vol. 1, no. 1 (Summer 1935), p. 145. Design and illustration by W.A. Dwiggins. Chapter 3 opening of One More Spring by Robert Nathan (Stamford, Connecticut: The Overbrook Press, 1935). Typography and illustration by W.A. Dwiggins. 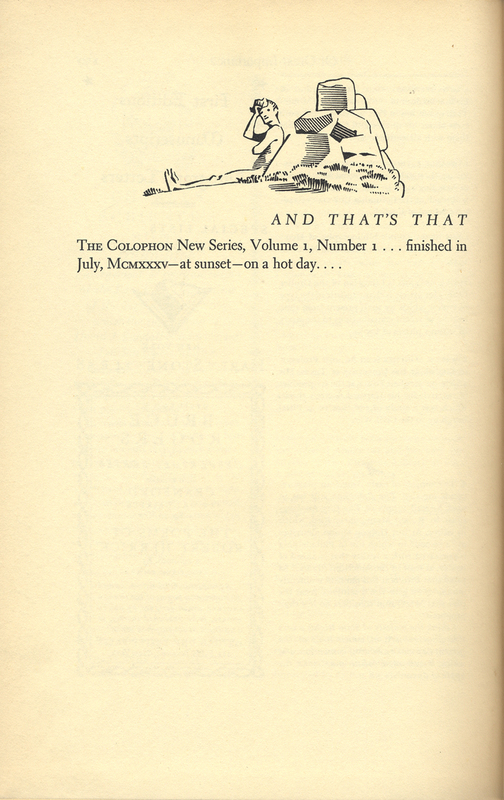 For the Summer 1935 number of The Colophon New Series Dwiggins made an illustration for “The Crow’s Nest” column, an illustration of a broken classical column for the obituary of Burton Emmett, the editor of the first series of The Colophon who had recently passed away, and seven small vignettes to be used as headpieces for articles. For the Autumn 1935 number he added a droll illustration of a hunched over scrivener hounded by musical notes and question marks for the “Notes and Queries” column; and for the Winter 1936 number he designed three more small vignettes for headpieces. Original artwork (cropped) by W.A. Dwiggins for “Notes and Queries” column in The Colophon New Series vol. 1, no. 2 (Autumn 1935). Image courtesy of Rare Books and Special Collections, Princeton University Library. 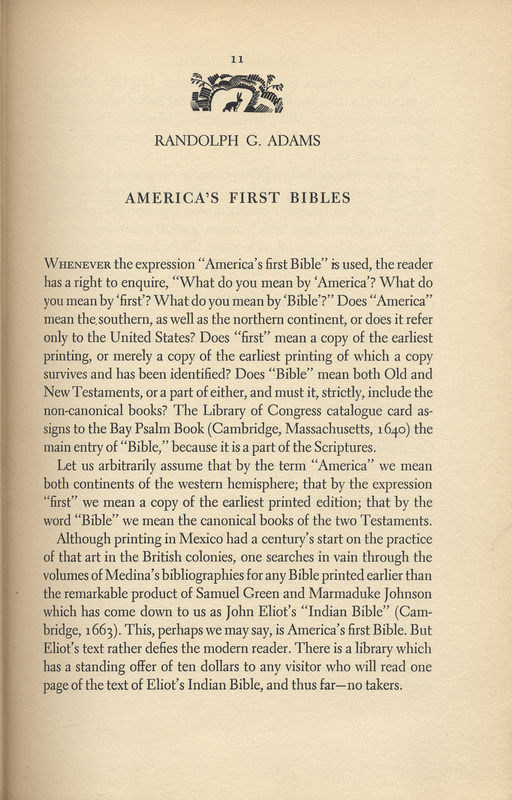 “America’s First Bibles” by Randolph G. Adams in The Colophon New Series, vol. 1, no. 1 (Summer 1935). Typography and headpiece by W.A. Dwiggins. Set in Electra with Bulmer for the title. No. 1 [Rabbit]—”America’s First Bibles” by Randolph G. Adams in vol. 1, no. 1 (Summer 1935), p. 11. No. 2 [Foliage]—”Herman Melville As I Recall Him” by Oscar Wegelin in vol. 1, no. 1 (Summer 1935), p. 22. No. 3 [Houses]—”Fly Specks and Folios” by Robert M. Smith in vol. 1, no. 1 (Summer 1935), p. 25. No. 4 [House]—”Stephen Collins Foster, Dramatic Collaborator” by Edward G. Fletcher in vol. 1, no. 1 (Summer 1935), p. 33. No. 5 [Tree]—”‘Waverley in America'” by David A. Randall in vol. 1, no. 1 (Summer 1935), p. 39. No. 6 [Ship]—”Alexandre Dumas, Benefactor” by F.W. Reed in vol. 1, no. 1 (Summer 1935), p. 57. No. 7 [Plant]—”George Eliot and John Chapman: A Fragment” by Blanche Colton William in vol. 1, no. 1 (Summer 1935), p. 65. No. 8 [Landscape]—”The Path of the Pioneer” by Robert P. Eckert, Jr. in vol. 1, no. 3 (Winter 1936), p. 404. No. 9 [Plants]—The 1886 Appleton ‘Alice’” by Flodden W. Heron in vol. 1, no. 3 (Winter 1936), p. 422. Rabbit headpiece from The Colophon New Series vol. 1, no. 1 (Summer 1935), p. 11. Design by W.A. Dwiggins. Foliage headpiece from The Colophon New Series, vol. 1, no. 1 (Summer 1935), p. 22. Design by W.A. Dwiggins. Houses headpiece from The Colophon New Series vol. 1, no. 1 (Summer 1935), p. 25. Design by W.A. Dwiggins. House headpiece from The Colophon New Series, vol. 1, no. 1 (Summer 1935), p. 33. Design by W.A. Dwiggins. Tree headpiece from The Colophon New Series, vol. 1, no. 1 (Summer 1935), p. 39. Design by W.A. Dwiggins. Ship headpiece from The Colophon New Series, vol. 1, no. 1 (Summer 1935), p. 57. Design by W.A. Dwiggins. Plant headpiece from The Colophon New Series, vol. 1, no. 1 (Summer 1935), p. 65. Design by W.A. Dwiggins. Landscape headpiece from The Colophon New Series, vol. 1, no. 3 (Winter 1936), p. 404. Design by W.A. Dwiggins. Plants headpiece from The Colophon New Series, vol. 1, no. 3 (Winter 1936), p. 422. Design by W.A. Dwiggins. 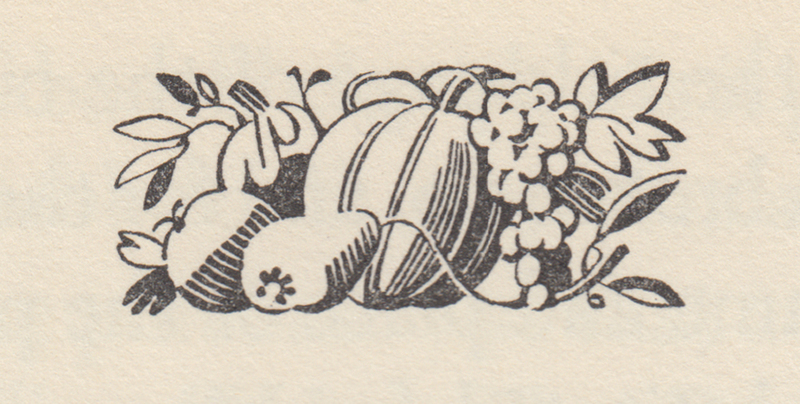 Gourds and grapes headpiece from The Colophon New Series, vol. 1, no. 3 (Winter 1936), p. 428. Design by W.A. Dwiggins. 1. 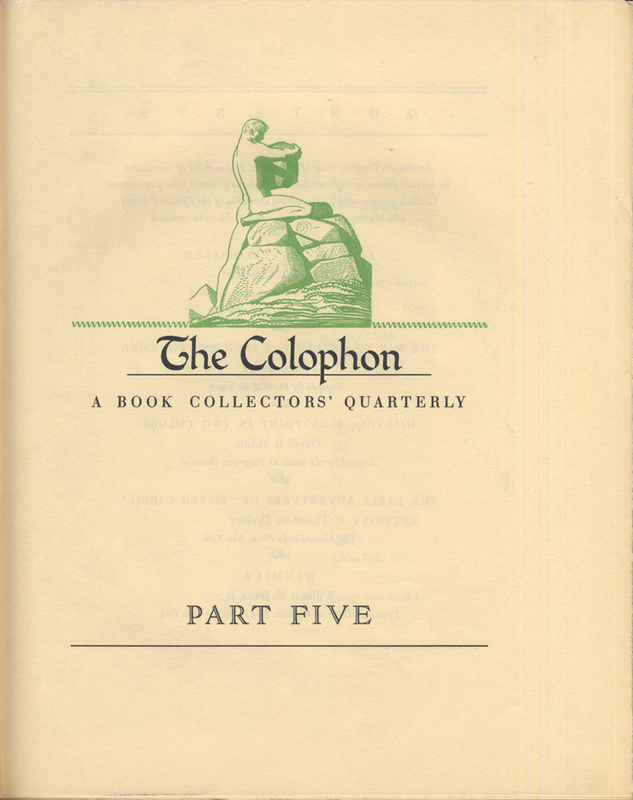 The first series of The Colophon ran from February 1930 (Part 1) to March 1935 (Part 20). Dwiggins did the cover for Part 5. See The Definitive Dwiggins no. 82. 3. W.A. Dwiggins to George Macy, undated (c.1933) loose letter in George Macy Companies Collection, Harry R. Ransom Humanities Research Center, University of Texas. The letter should be in Folder 31, Box 24. 4. W.A. Dwiggins to Paul Johnston, 15 March 1935; and Dwiggins to Johnston, undated (c.1932) in Folder—Typography 1934, Box 1, Paul Johnston Papers, New York Public Library. Despite the 1934 date, the folder includes correspondence ranging from 1931 to 1935. 5. W.A. Dwiggins to George Macy 14 April 1934, Macy to Dwiggins 16 April 1934 and Dwiggins to Macy 17 April 1934 in Folder 7, Box 39, George Macy Companies Collection, Harry R. Ransom Humanities Research Center, University of Texas. It should be noted that Mergenthaler Linotype dubbed all of its typefaces-in-progress as “experimental.” There was nothing unusual about the design that became Electra. 6. In the end LeClerq did not finish delivery of his manuscript for Gargantua and Pantagruel until January 1936, but Dwiggins had already begun testing pages with Electra in December 1935. See Gargantua and Pantagruel by François Rabelais translated by Jacques LeClerq (New York: The Limited Editions Club, 1936. For progress of The Dolphin no. 2 see the memo from The Limited Editions Club to Yale University Press 23 April 1935—among other correspondence between January and May 1935—in Folder 9, Box 111, George Macy Companies Collection, Harry R. Ransom Humanities Research Center, University of Texas. The Dolphin no. 2 was set in Monotype Bell. Comps for the title page marked “Spring 1935” provide a rough indication of when Dwiggins was working on the design of The Colophon New Series. 7. Oswald Cooper was apparently sent an advance showing of Electra. See Oswald Cooper to Chauncey H. Griffith 2 March 1935 in W.A. Dwiggins Folder, Mergenthaler Linotype Archives (formerly at Melville, Long Island—where I examined them in 1979—but now presumably part of the unprocessed Mergenthaler Linotype Company Records, National Museum of American History, Smithsonian Institution). Electra was introduced in The Linotype News (October 1935). Emblems and Electra was completed by the end of that month. See W.A. Dwiggins to Paul A. Bennett 29 October 1935 in Case 4, Box 10, Paul A. Bennett Papers, New York Public Library. 8. W.A. Dwiggins to Elmer Adler 17 June 1935 note attached to artwork. The crow was made by Mergenthaler Linotype rather than as an electrotype: “The ‘crow’ ¶ mark is Lino 6 pt border #282” Note and artwork both in GC035 Folder, Special Collections, Firestone Library, Princeton University. 9. Although Dwiggins is only credited with the format for the first four numbers of the New Series of The Colophon, it seems obvious that he was responsible for the changes made for the Autumn 1936 issue. At the same time that it was in production, he was working on Not Under Forty by Willa Cather (New York: Alfred A. Knopf, 1936). Both pair Linotype Janson Italic for running heads with Electra for body copy, a combination Dwiggins subsequently used often in his book designs for Alfred A. Knopf. Not Under Forty was the first trade book set in Electra. 10. The Colophon New Series vol. 1, no. 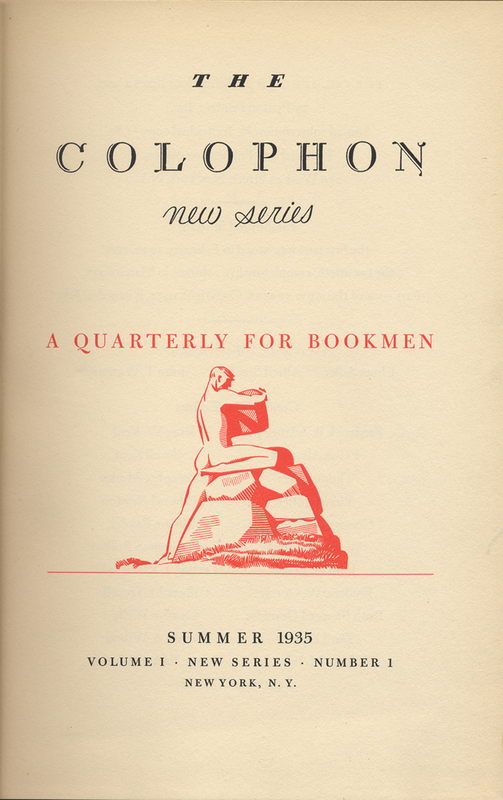 4 (Spring 1936); and The Colophon New Series vol. 2, no. 1 (Autumn 1936), p. 155. Throughout the New Series, Bulmer, one of Dwiggins’ favorite typefaces, was used for the secondary information on the title page and for the titles of articles and columns. 11. Adler’s less than enthusiastic assessment of Electra as text type was not shared by Philip Brooks who, in his review of The Colophon New Series for The New York Times “Notes on Rare Books” column, remarked that, “It reads easily.” See The New York Times 18 August 1935. Electra Italic was a sloped roman. Electra Cursive, a true italic companion to Electra, was not released until 1940. 12. For Adler’s comments on Dwiggins’ design see “The Crow’s Nest” in The Colophon New Series vol. 1, no. 1 (Summer 1935), p. 147. 13. The artwork for both versions of the title page illustration, along with comps for the title page lettering, are in Folder GC035, Graphic Arts Collection, Rare Books and Special Collections, Fireston Library, Princeton University. 14. The headpieces were used in the same sequence throughout the entire run of The Colophon New Series. The names of the headpieces are my own invention. 15. None of the headpieces are included among the 37 ornamental items in The Work of W.A. Dwiggins (New York: The American Institute of Graphic Arts, 1937). Unfortunately, there is no surviving artwork for the headpiece vignettes in either the two Dwiggins collections at the Boston Public Library or the Graphic Arts Collection at Princeton University.